Have you noticed the word “organic” is growing rapidly in many areas associated with food. 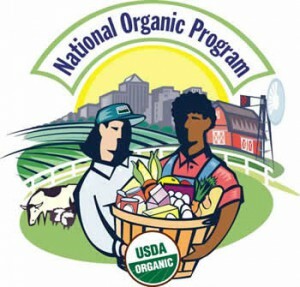 What does this term mean and you may be wondering what is in organic food? Perhaps an equal question would be what is not in organic food? I walked into a large grocery store the other day and the first thing that caught my eye was all the banners with the “organic” label on them. This wasn’t anything new it is just that I hadn’t payed much attention to this before. Not only did I see so many organic banners I saw a clear division as from the entrance to the store I saw the right side of the first isle (mostly produce) labeled organic and the left side was the conventional items. It was the same in the meat section as well. You can really start to see that there is a clear movement in the food arena as the organic name takes hold. It’s not just a small area of the store anymore. You really have to ask if there is a benefit to shopping the organic side of the store. 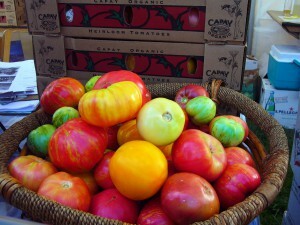 In most cases the items don’t look any different than the non organic varieties. Most people just notice the higher price tag. So is the higher price worth it or is the organic name just a marketing tool to persuade folks to buy a more expensive product to fatten the company’s bottom line. What about the organic certifications on some of the labels? Are they really a higher standard that the producers are following? These are great questions to ask and it often takes some deep research behind the scenes to find the answers and I will share with you what I have found but don’t take my word for this as you need to do some digging yourselves and I can show you a few places to start. If you are taking an interest in the organic food world there may be numerous factors persuading you. For some it is health issues for them or loved ones. You may have many other reasons for looking into the organic food realm but the fact is more and more people are taking an interest in this. So how do we sort out all the information and find the truth about what we should be eating. 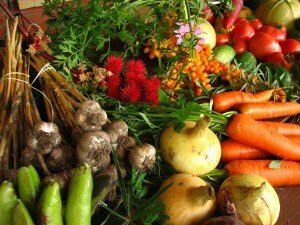 Lets look at a few “notions” that go along with organic food to get you thinking. The notion that it is more nutritious. The common idea is that organic food is more nutritious and this may carry some truth however the question that needs asked is how nutrient dense is the food and is it as nutrient dense as it needs to be to support vibrant health? When you look at organic certification requirements there really isn’t anything about making the food more nutritious. Granted that organic production practices help improve nutrient value it doesn’t guarantee the highest nutrient value possible. You can still grow food that is nutrient deficient in organic approved facilities because the soil is nutrient deficient. To understand what nutrient rich food is you have to see the real thing to be able to compare it with inferior food. The best way to see and understand truly nutrient dense food is to take a look at Paul Gautschi and the video at backtoedenfilm.com as he has got the best examples I have seen to grow nutrient dense food. It is a real eye opener and will make more sense as to why organic certified food may not have all the quality we need it to have. Keep in mind that only nutrient rich food can come from nutrient rich soil. The Federal stamp of approval. There is a notion that if a food product has a USDA certified organic label on it that it must be safe. Once again there may be some truth to this however is our government the best place to put our total food trust in? One thing to consider is that the same government that puts organic labels on food is the same government that is approving all the pesticides, herbicides, and Genetically modified organisms (GMO’S) that we are trying to avoid by purchasing organic food. Kind of like Budweiser sponsoring an alcoholic rehabilitation clinic isn’t it? I don’t disagree that the USDA has some good regulations to reduce chemical and engineering issues but I caution putting our food safety in their hands without questioning their tactics. Organic doesn’t mean it is good for you. One thing to take note of is the USDA approves soy that is grown to their organic standards to be in food products that they label as organic. The problems with this is that large amounts of research shows that soy is not a healthy food ingredient whether it is organic or not. Soy contains phytic acid that actually disrupts our digestive system and blocks our body from getting nutrients from food. We should avoid soy (unless it’s fermented) no matter how it is grown and especially for babies and kids. See the Weston Price website to get the whole soy story if you want more information. I want to make it clear that I am not against organic food and I recommend you buy organic food as it is less susceptible to chemicals and genetical engineering. However what we need to understand is that it is important to know how the food is grown and this is more than looking for organic labels. The very best way to get the best food possible is to know what nutrient dense food is from someone like Paul Gautschi or the Weston Price foundation and grow your own or buy local from someone that understands what nutrient rich, chemical free, and sustainable means. If you can’t do this then by all means go for the organic whole unprocessed food at the store but be sure to know what ingredients are good for you so you can avoid items like soy and other health damaging ingredients. Places to help get quality food. There are a few other organizations that help connect people with good food and I will show you just a few of the best ones. Certified Naturally Grown This organization is an independant group with no ties to government or corporate food producers and they have standards above and beyond that of the USDA. They also help connect people with local producers. Eat Wild They are a great website that is about educating and connecting farmers and consumers. See how we grow food. You are more than welcome to check out how we grow quality food such as beef and chicken at our place. We are not USDA certified organic and we don’t care to be since we would rather be customer certified because we feel we uphold a higher standard knowing that the customer is watching and seeing what we do. The food we raise is also our food as well and we are fussy so if it isn’t something we would eat we don’t do it. I hope this information helps and doesn’t cause any confusion. If you have a desire for good food then keep searching and you will find it. I would like to hear your thoughts and questions about organic food and please leave them below. Thank you and God bless! I really enjoyed your article. My husband and I have recently started eating organic, but this mostly come out of our family garden so we can be sure it is exactly what are wanting. I have looked at a couple of scientific articles out of Sweden that show pesticides in the blood of people who consume conventional vs. organic food which is what ultimately made me decide to switch. Thanks for the information. Thanks for the comment Shelby! There is a ton of research on pesticides and they are showing that it is causing way more problems than the companies making the pesticides what to admit. Keep growing your own food since that is the best way to know what you’re eating. Be sure to watch the Back to eden film to understand how to get the most from your garden. It is a great video and its free!. God bless! You have some great information in your website! I always knew organic was better, but I never understood why. The fact that organic food is less susceptible to chemicals and genetical engineering is a huge plus for me. Your explanation is very comprehensive and I am glad I came across your website since you answered a lot of my questions. Glad you found this information useful Juan. It is important to keep our exposure to chemicals and genetic engineering to a minimum. Hope you are able to find good food near you. As someone who is massively into his health & fitness also, I found this review to be of great value! You talk about food nutrient density, I had never thought about that aspect of it. Just because it’s an apple, doesn’t mean it isn’t nutrient dense, it depends on the soil! Many thanks for the review, I shall keep my eyes open for more nutrition based articles on your site from now on! Thanks for stopping by Mark! Most folks don’t think about nutrient density in food but if we think about it most of our health problems today are degenerative based so that means our bodies are not getting the nutrition they need and are wearing down. We need the nutrients that can only come frorm nutrient rich soil. Glad the post got you thinking. I try to purchase organic foods where possible and find the best sources for this is at farmers markets and farm gate sales. This sort of produce tends to have a better taste and flavour too! I love giving my kids organic foods as I believe that too much bad stuff such as pesticides are going to contribute to future health problems. Sounds like you are on the right track Kris! We think the better food we eat the better our health is and it shows more and more over time. Our industrial food supply is so depleted of nutrients and it is full of toxic chemicals and additives that it isn’t fit to eat. That is why we do everything we can to grow safe nutrient dense food that supports life. Thanks for stopping by and keep seeking that wholesome food!